Breakfast with my mommymates have been postponed for a week due to the typhoon and since we're back in school today after a week-long vacay, we scheduled a breakfast date in Manila's Chinatown (our default breakfast area). I arrived first and since most establishments there were still closed (still too early), I decided to wait for J at Chuan Kee (had a bowl of congee). Luckily, J didn't take long to arrive so we did our errands first while we waited for another friend. 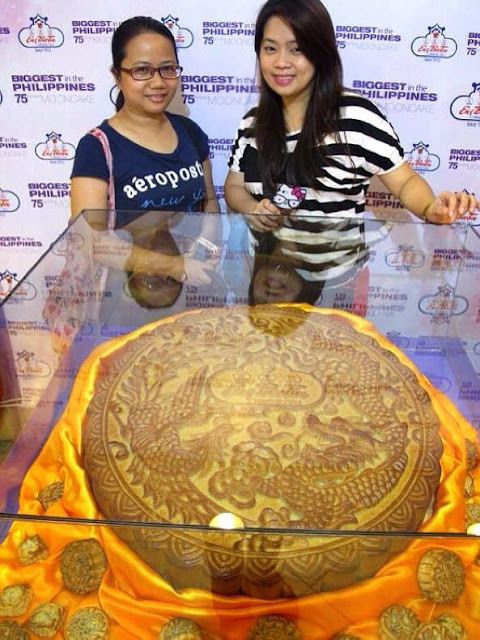 And since I've been seeing this giant mooncake at Eng Bee Tin's FB Page, I asked J if we can check it out and take some photos. Anyways, you can have your photo-op with this huge mooncake at Eng Bee Tin's store in Ongpin, Manila.